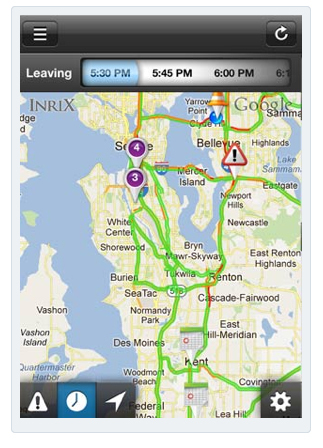 Last week saw the release of INRIX Traffic V4 app for IOS users. Often traffic devices and apps lose their way a bit when they cross the Atlantic, but INRIX are world leaders in traffic information. According to their website, they collate traffic information in 30 countries, using more sources than anyone else in the industry. This tells me if anyone knows our roads inside out then INRIX should. Via this app INRIX promise to bring the knowledge of over 100 million traffic reporters straight to our tablets and smartphones, and using this information take control of our commute by helping us avoid traffic caused by incidents, events, road works or heavy congestion. Getting us to work, or the kids to school, on time, and could even save us money by saving us time and petrol. I downloaded the app on my iPad, which didn’t take long, and the set-up process was just as quick. I was prompted to input my home address, which apparently ‘does not exist’ …not a great start… so I had to opt for my neighbour’s house 4 doors down the road. I was then asked to type in my work address and I got the same message, ‘this address does not exist’…breathes deeply… I eventually went with less detail, and got in. So, we know where we are, and we know where we are going. Remember, this is not a sat nav. It won’t tell us how to get somewhere, it will only tell us when to divert and which roads are clear to use. The scrollbar at the top of the screen lets us choose our departure time, which in turn applies historical data to our journey – like peak rush hour congestion over that journey – and then when we set off, using real-time updates, the app scans our journey as we go alerting us to any other hold-ups. This is a good app for anyone who doesn’t need a sat-nav, (you couldn’t use both at once.) I’m sure there are similar features built into lots of sat navs but this is free, simple to use and if you don’t need all the bells and whistles of a sat nav then why have them. Getting a precise address match isn’t really a problem when you already know your departure point and destination, which is a relief. The best part though, the follow-me setting, where you might know your commute or the school run like the back of your hand, follow-me will follow you wherever you are going, alerting you to any incidents up to 5km around you, so you can change course and avoid them, wherever you are heading. You can upgrade for £17.49 which includes traffic cameras and allows you to store more favourite destinations, this could be handy and considering the cost of a single speeding ticket alone is very tempting. Previous Previous post: Tech Lovers Gloves – Keep warm!